Private 23404 Ellis Bertie Graham Pounds, 179th Company, Machine Gun Corps. Bert was born in Newbury on 19 Jan 1896, the youngest of the two sons of Henry Pounds and his wife Jane née Hurkett. While his birth registration is indexed as ‘Ellis Bertie’ and his name on local war memorials is given as ‘E B Pounds’, the additional ‘Graham’ is a constant throughout the few surviving records of his military service. So, while it may not be a formal part of his name, Bert himself must have included it when he enlisted so we include it here. Henry was a platelayer who worked for the Great Western Railway. 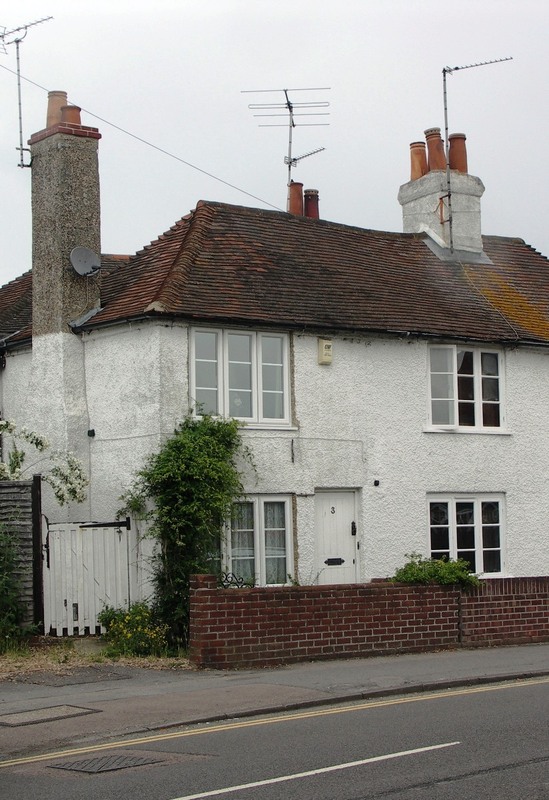 The family lived at 3 Enborne Road (also known as 3 Lamb Cottages), next door to the Lamb public house. His older sibling was Arthur Henry (born 17 Mar 1894); he also had a much younger sister, Gladys Marjorie, born in 1910. Young Bert was fortunate enough to win a place at Christ’s Hospital School in Horsham, Sussex. This prestigious charitable public school offers a high class public school education to ‘poor’ children. In 1911 (when Bert was there) 36 places were reserved for children from Newbury under the terms of Wests’ Gift – a charity that is still in operation today, though it no longer funds quite so many places. Children leaving Christ’s could expect to escape the labouring life led by their fathers and work in white-collar occupations. Sadly Bert’s career as a clerk was interrupted before it had really started by the declaration of war in August 1914. Bert found a job as a clerk in the City, which explains how he came to enlist at Westminster into the London Regiment in late 1914 (almost certainly December) and was allocated the regimental number of 4392. 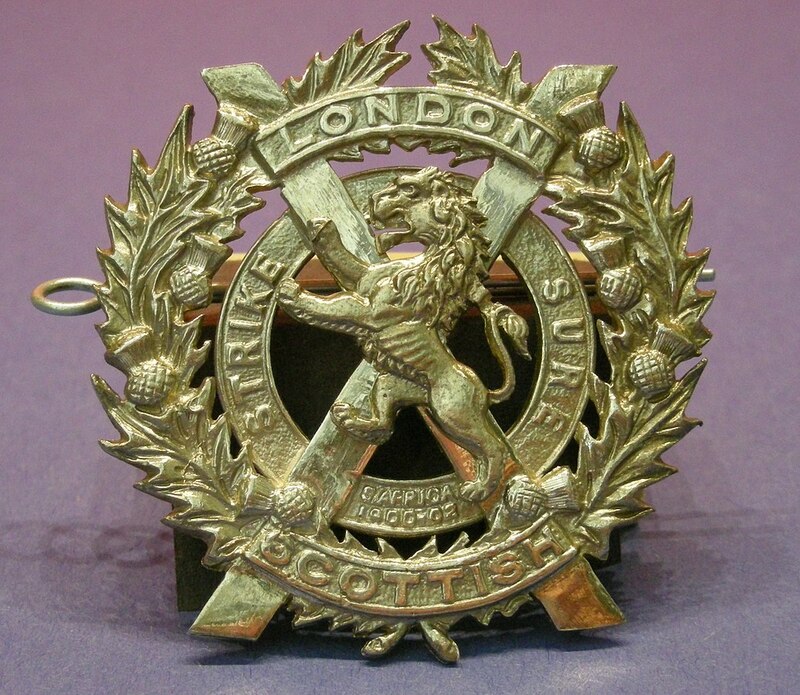 The regimental badge of the London Scottish. The London Regiment was unusual in being entirely composed of Territorials, part time soldiers before the war, but bolstered by huge numbers of recruits through the war. One motive in joining a Territorial unit might be that they were dedicated to home defence duties; a Territorial could not be sent to the front unless he volunteered to go. However, even by February 1915 battalions of the London Regiment were at the front, the majority of pre-war Territorials having volunteered to go and fight. However, there were many who did not volunteer; the cater for this split the Territorial battalions were split into First Line units, designated the 1st/4th, 5th etc and Second Line designated 2nd/4th etc. These are usually abbreviated further as 1/4th or even 1/4 etc. Many regiments also formed a Third Line which usually became training/reserve battalions. The First Line comprised men who signed the Imperial Service Obligation indicating their willingness to be sent overseas (most arrived in a theatre of war in 1914 or 1915). The Second Line was kept in the UK, as dictated by the men’s terms of service, until those terms were effectively altered by the Military Service Act in 1916 – which obliged men to sign the Imperial Service Obligation or resign and face conscription. New recruits like Bert would sign the Imperial Service Obligation (they wouldn’t be accepted if they didn’t), but needed a considerable period of training (at least six months) before being ready to be sent to one of the battalions in the field. It would appear that upon enlistment he was posted to the 2/14th Battalion of the London Regiment also known as the 2nd Battalion, London Scottish. A lad from Newbury would go to war in a kilt! The new men signed the Imperial Service Obligation when they enlisted; others, reluctant to sign in August 1914 subsequently did so. So, while the battalion remained in the UK it did supply men to units in the field, in particular to help bring the 47th Division up to strength prior to its departure for the front in March 1915. In January 1916 the battalion was sent to Salisbury Plain in January 1916 as a part of the 179th (2/4th London) Brigade in the 60th (2/2nd London Division). Where it would prepare for the move overseas. The Division landed in France in June 1916. It was not in France for long; in November it was transferred to Salonika in northern Greece, one of the almost forgotten fronts or the war. It took part in the fighting there around Lake Doiran before being shipped out again, this time to Egypt. At some point Bert transferred to the Machine Gun Corps (perhaps he volunteered to get out of the kilt); this was not a transfer to a distant unit; he joined the 179th Company, which was the machine gun company within the 179th Brigade; he would still be fighting alongside his old kilted comrades. The 60th Division became a part of the Egyptian Expeditionary Force(EEF) that advanced from Egypt, across the Sinai and into Palestine. In early December 1917 the EEF captured the emotionally important city of Jersualem. Since August 1917 the Turkish force defending Palestine had been bolstered by a German Corps and Turkish veterans of the Gallipoli campaign and were ably commanded by General Erich von Falkenhayn and included the Ottoman Empires most successful commander, Mustafa Kemal (later Kemal Ataturk). This force counter-attacked at Jerusalem on 26-30 December, which was beaten back with heavy losses. 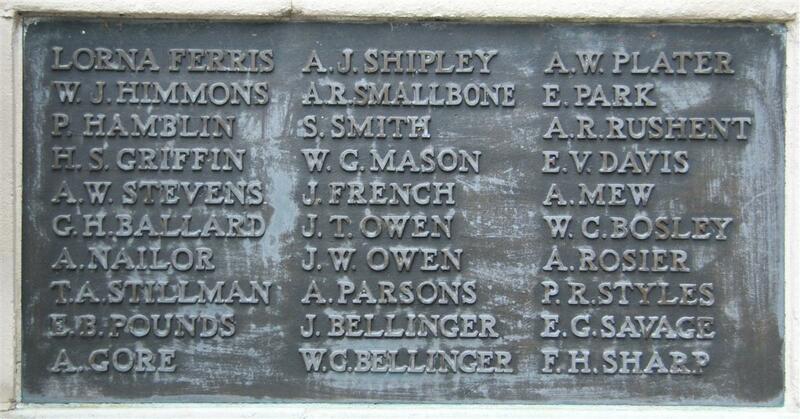 Inevitably there were losses among the defenders, among them was Bert, killed in action. POUNDS – Dec 26, 1917, killed in action, Pte E B Pounds, the youngest son of Mr and Mrs Pounds, of 3 Enborne-road, Newbury, aged 21 years. Mrs Pounds, of 3, Enborne-road, Newbury, whose youngest son, Ellis (Bert) was killed in action on December 27, 1917, has received a letter from a Sergt in his Company, saying that “he was shot by a Turkish sniper, and died instantaneously, so that he was fortunately spared any suffering.” He also states that Ellis was greatly liked and respected, and will be very much missed by all. Prior to joining in 1914, he was a clerk in the city, from where he enlisted in the London Scottish. Most of his training was done on Salisbury Plain. Deceased was only 21 when he died. Mrs Pounds has another son serving in France, who has been wounded twice. It is never wise to take letters like this to be reliable accounts – rare indeed is a description of the agonising, slow death of an irritating shirker whom his comrades would not miss. The aim of the writer was to comfort the bereaved, not to create historically accurate evidence. Yet, even at this distance in time one wants to believe the account. Bert was buried in the Jerusalem War Cemetery, grave U. 11. Locally he is remembered on Tablet 6 of the Newbury Town War Memorial as well as the parish memorial board and roll of honour in St Nicolas’ Church. In loving memory of Pte E B Pounds, youngest son of Mr and Mrs H Pounds, Enborne-road, Newbury London Scottish, killed in action in Palestine, December 27, 1917. Bert’s brother Arthur is also mentioned in the newspaper report of the circumstances of his death. Details of his service have proved elusive; in the Active Service Roll printed in the Newbury Weekly News until the introduction of conscription he is listed as being a Private in the Royal Field Artillery so he was probably the man who was awarded the 1914-15 Star, British War Medal and Victory Medal under the name Henry A Pounds (Gunner, 58381). This man landed in France on 19 May 1915 and survived the war, as did Arthur who died in Essex in 1961.